Friday the 13th proved to be lucky for Matt Crafton, driver of the No. 88 Chi-Chi’s/Menards Toyota Tundra, and his ThorSport Racing team in Friday’s JACOB Companies 200 at Dover International Speedway. Starting from the fifth position, when qualifying was cancelled due to weather, and the field was set based on combined practice speeds from Thursday afternoon, Crafton took the race lead at lap 123 of 200, and never looked back. Leading the final 78 laps, the two-time NASCAR Camping World Truck Series (NCWTS) Champion, earned his first victory in 16 starts at the “Monster Mile,” and his first win of the 2016 season, clinching a spot in the series first round of the chase, and taking over the NCWTS points lead for the first time this season. 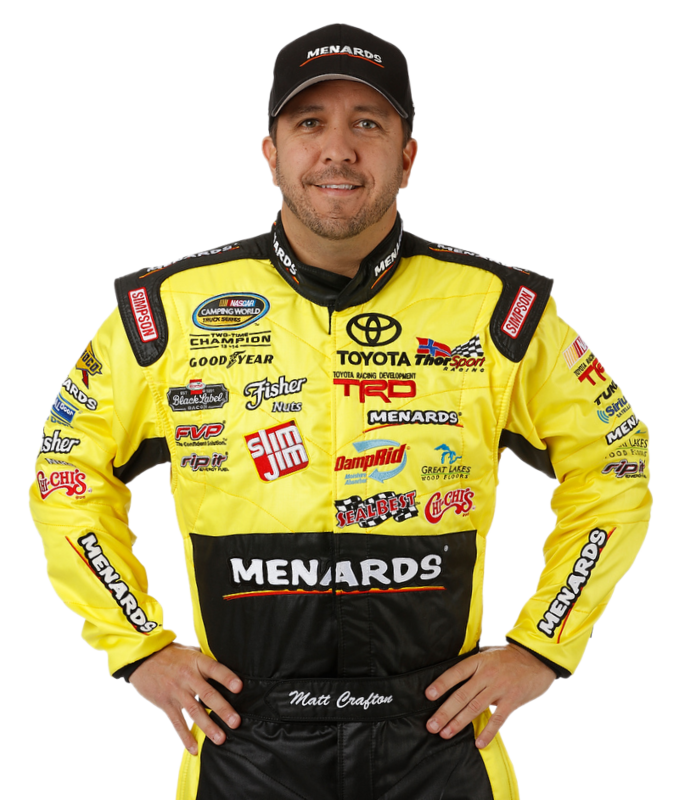 Crafton, who battled a Menards Toyota Tundra that was “snug through the center and off” in the early laps of the 17th annual event, maintained a position inside the top-five for the entire 200-lap race. Carl “Junior” Joiner brought the No. 88 machine to pit road, under caution, at laps 44, 81, and 133, respectively, for four tires, and fuel. During a long green flag stint, Crafton took the lead from the 29 truck on lap 123, and never looked back. The Menards driver maintained the lead through his final pit stop of the night, and the final two restarts at laps 138, and 173, respectively, to bring home his 12th win in 366 career starts in the NCWTS. How does it feel to win at Dover? How ware the last few laps from your view point in the lead, and with Daniel Suarez right behind you? The NASCAR Camping World Truck Series had two practice sessions on Thursday afternoon in preparation for Friday’s JACOB Companies 200 at Dover International Speedway. Matt Crafton was 5th, and 21st, respectively. Qualifying for the 17th annual event was cancelled on Friday afternoon due to weather. The 32-truck field was set based on the rule book – combined practice speeds – and Crafton rolled off from the fifth position for the 200-lap race. Making his 16th career start at Dover International Speedway, Crafton started fifth, led the field for 78 laps, and finished first. Crafton’s win was the first in 16 starts at the 1-mile concrete oval, the first of the 2016 NCWTS season, and the 12th of his career. In 16 starts at the “Monster Mile,” Crafton has led 151 laps en route to one win, five top-five and 10 top-10 finishes.